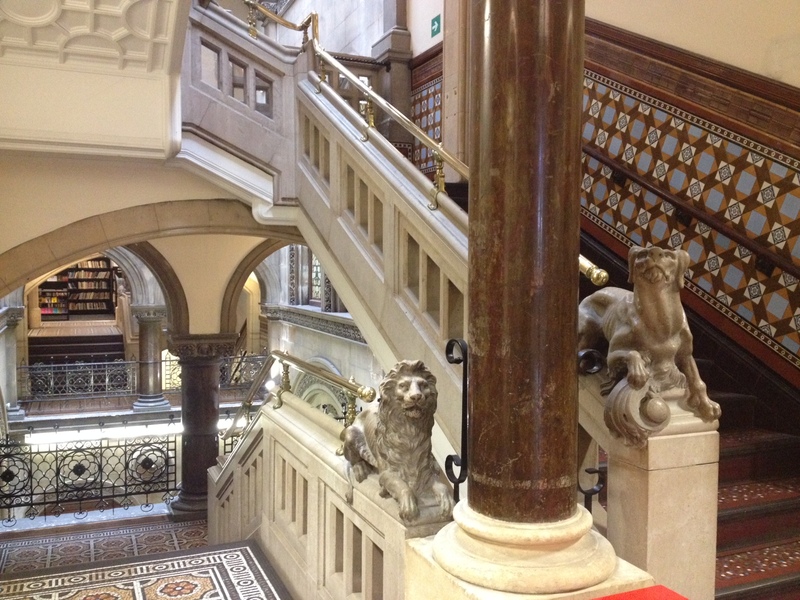 Come to Leeds Central Library looking for information about fossils, and we might suggest you check out our staircases as well as a few books! This way for fossils. Library staircase from the ground floor. There are 103 steps to the top floor of the library, assuming you come in via the Calverley Street entrance. The first nine of these are actually outside, and take you up to a disused, sunken portcullis just before the main glass doors. Hop over this and three further steps will bring you into our impressive atrium and, if you do decide to climb all the way to the top, you’re looking at 94 more. But don’t worry – our fossil-hunt only requires you to go about halfway. The library has two large public staircases, reflecting the original design of the building as multi-purpose municipal offices. As a long-ago visitor to what was essentially the Victorian One-Stop Centre, you would’ve entered from Calverley Street and probably continued straight ahead to pay your utility bills in the room that’s now the main lending library. That means the staircase to your left is essentially the main staircase. 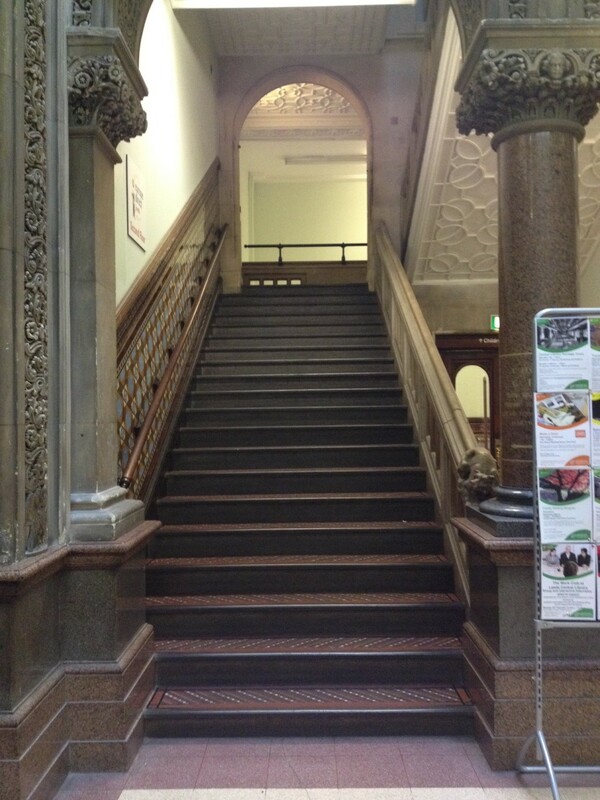 However, we’re going to take the other set of steps – the one that begins in the area near the lift and Tiled Hall Cafe, and which would have originally led up to the lending and reference libraries, and served visitors using the Headrow entrance. Stony faced stares. Heraldic beasts outside the Art Library. Behind the lion, embedded in the smooth stone handrail leading down, you can make out some strange, whitish flecks. These are the most noticeable of our library fossils! Their presence tells us that the stone here isn’t marble (the extreme conditions required to form that type of rock would destroy any fossils within it) but more likely polished limestone. The fossils themselves are possibly plant-based or some kind of crustacean – look carefully and you’ll notice tubes and blade-like structures. Now turn to look at the brownish-red column that stands betwixt the heraldic beasts. This is made entirely of 380 million-year-old Devonian coral reef… In fact, you could say it’s one giant fossil! We hope you’ll find that impressive but, if you still haven’t had your fill of petrified prehistoric pieces, carry on up the second set of stairs to the Information and Research department on the library’s second floor, where you can peruse an assortment of interesting books on the subject. Many of these are specialist monographs published by the international Paleontological Society; more interestingly perhaps is the work of those natural scientists involved in the evolutionary debates of the 18th and 19th-centuries, arguments that revolved around differing interpretations of fossilised remains. While the study of fossils can be traced to Antiquity and authorities such as the Grecian philosopher Theophrastus – specifically his History of Stones, of which the library holds a 1774 edition – as a modern science palaeontology has its roots in George Cuvier’s 18th-century development of comparative anatomy. Cuvier’s key work is – Le Règne Animal (The Animal Kingdom) and an English-language extract from his writings can be found in Oliver Goldsmith’s lavishly-illustrated 6-volume A History of the Earth and Animated Nature. Cuvier developed the then-revolutionary belief that some species identifiable through the fossil record were distinct groups that had, at some point in the Earth’s distant past, become extinct. 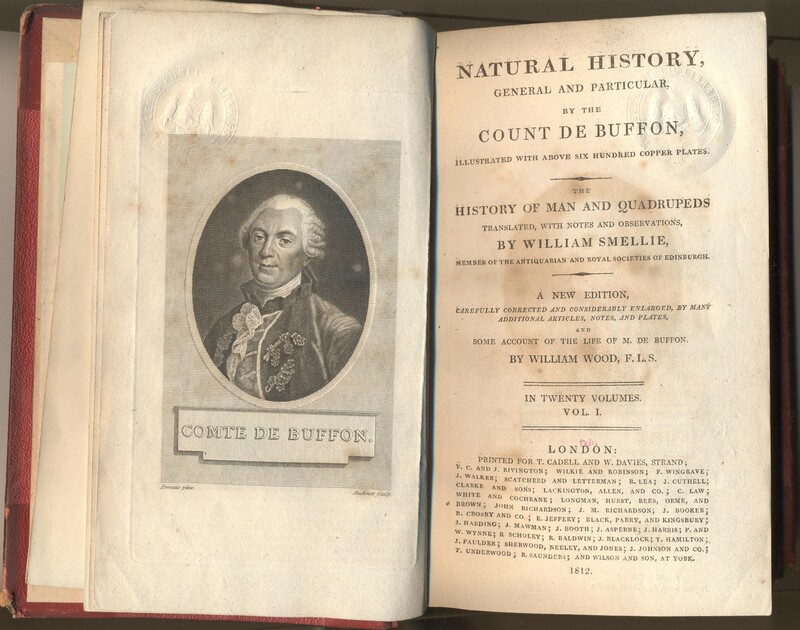 This was in contrast to the prevailing view of other authorities such as the Comte de Buffon, who believed that “fossils found in Europe of animals such as the woolly mammoth were remains of animals still living in the tropics, which had shifted out of Europe as the earth became cooler.” Buffon’s writings can be sampled in our copy of his Natural History: General and Particular. Cuvier’s extinction thesis came to be known as “catastrophism” – the idea that singular events of immense magnitude were responsible for the mass extinction of species. 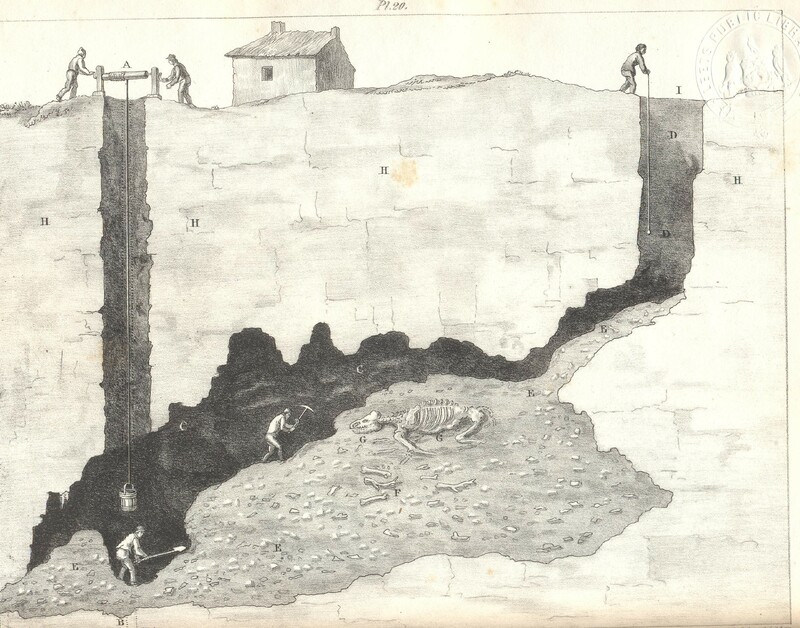 This theory led to William Buckland, an English theologian, geologist and paleontologist, writing his classic 1824 work Reliquiæ Diluvianæ, or, Observations on the Organic Remains Attesting the Action of a Universal Deluge – a first edition of which is available to read in the library- on precisely that theme; the relationship of fossil remains to an event of, quite literally, Biblical proportions: the Great Flood. 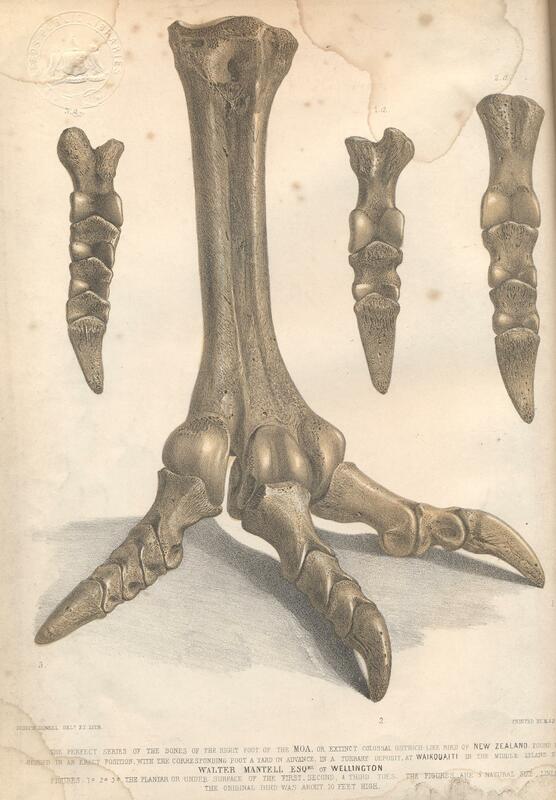 Buckland was sufficiently respected within the burgeoning Natural History community that he was awarded the honour of a dedication in Gideon Algernon Mantell’s A Pictorial Atlas of Fossil Remains, a volume containing 74 colour illustrations from fossil remains. And yet other observers of the fossil record, such as Charles Lyell, reacted against Buckland’s writings preferring the theory of “uniformitarianism”. This belief, explored in works such as Lyell’s The Principles of Geology – extracts from which can be read in the 1911 volume The Student’s Lyell – held that life on earth was shaped by long-term forces, rather than the one-off “shock” events described by Cuvier and Buckland. Lyell, in turn, was a close friend of the young Charles Darwin, who integrated some of Lyell’s work into his own observations of geology and the fossil record – as seen in his Geological Observations (1876) – which led directly to On the Origin of Species. Ironically, Lyell himself did not hold fully to those theories – even though his The Geological Evidences of the Antiquity of Man (1863) shows the clear influence of Darwin’s views. All the books mentioned here are available to view in the Information and Research Library, with some available for loan. Contact the department on 01132478282 or at informationandresearch@leeds.gov.uk to find out more.